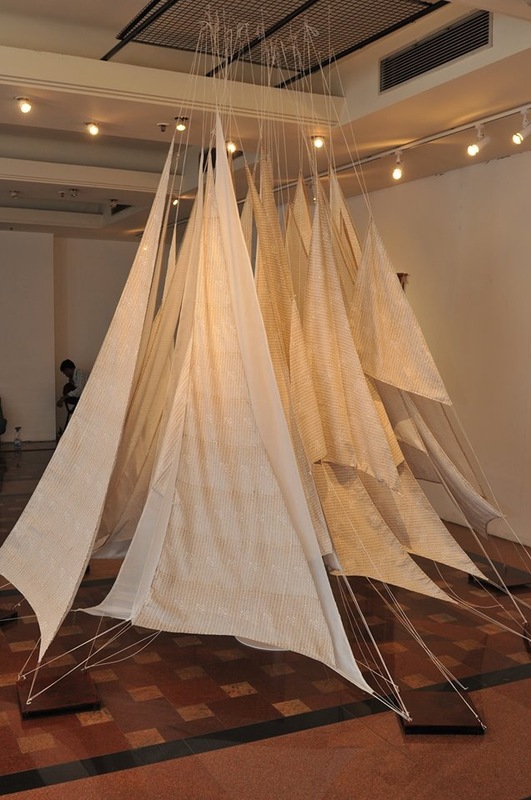 Shelly Jyoti Salt: The Great March’ THE MARCH: INTEGRATING KHADI 2013 Site specific installation: 30 meters of 8ply khadi, printed with Sanskrit calligraphy. 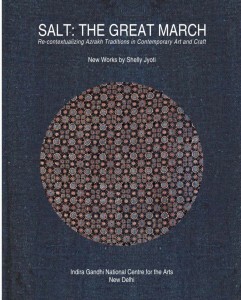 Exploring salt as a symbol of non-violence and investigating the sarvodaya theory in the practice of nonviolence, tolerance, peace and harmony through the narratives of swadeshi politics, these works draw upon the history of India’s colonial past and Mahatma Gandhi’s 1930 Dandi March, which began the Salt Satyagraha and became an important part of the Indian independence movement. 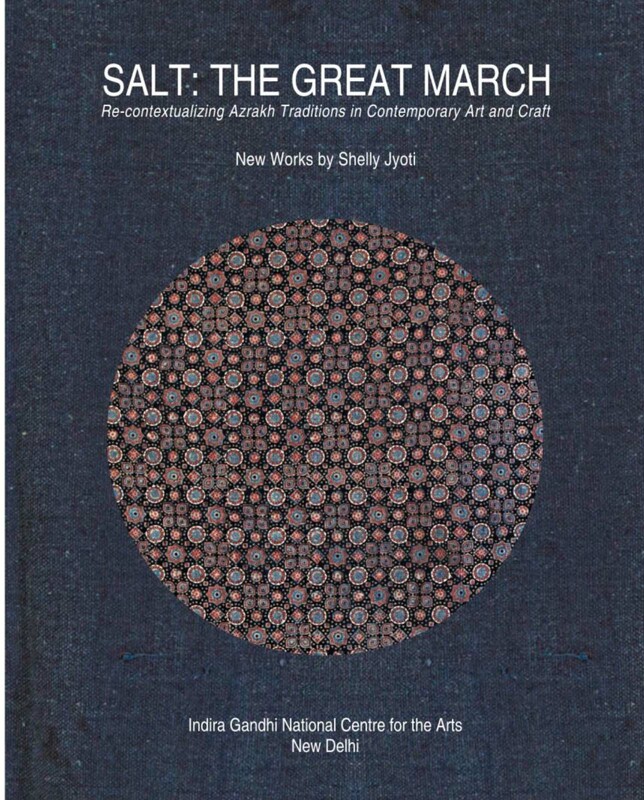 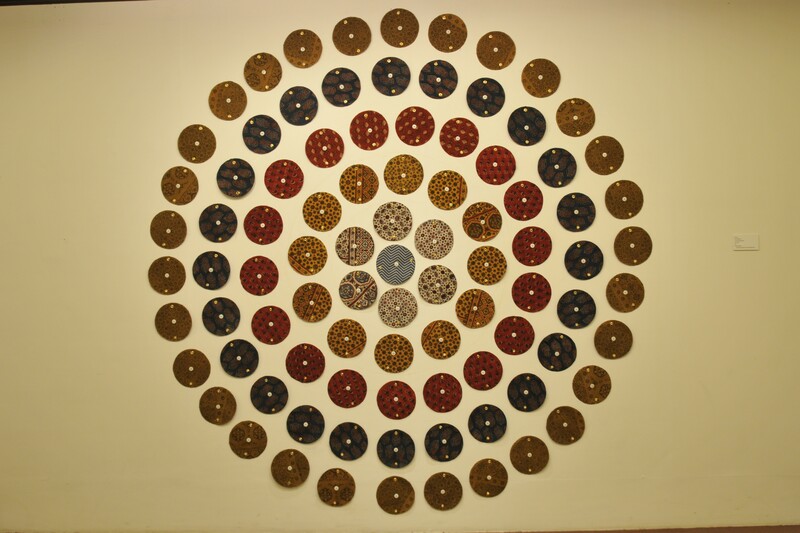 In her new series, ‘Salt: The Great march 2013’, artist Shelly Jyoti explores the possibilities of establishing alternative societies where Gandhian ideals of ‘swadharma’ and ‘sarvodaya’ could be adhered to and sustained with sincere implementation. In a society where patriarchal values threaten the free existence of women, the artist feels that re-introducing Gandhian ideals with critical changes would function as a correctional force. 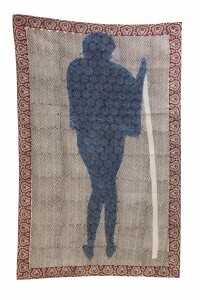 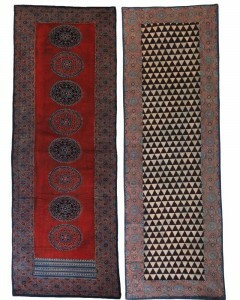 This new complementary body of works are complementary are continuation of Jyoti’s earlier series, ‘INDIGO Neel Darpan’. 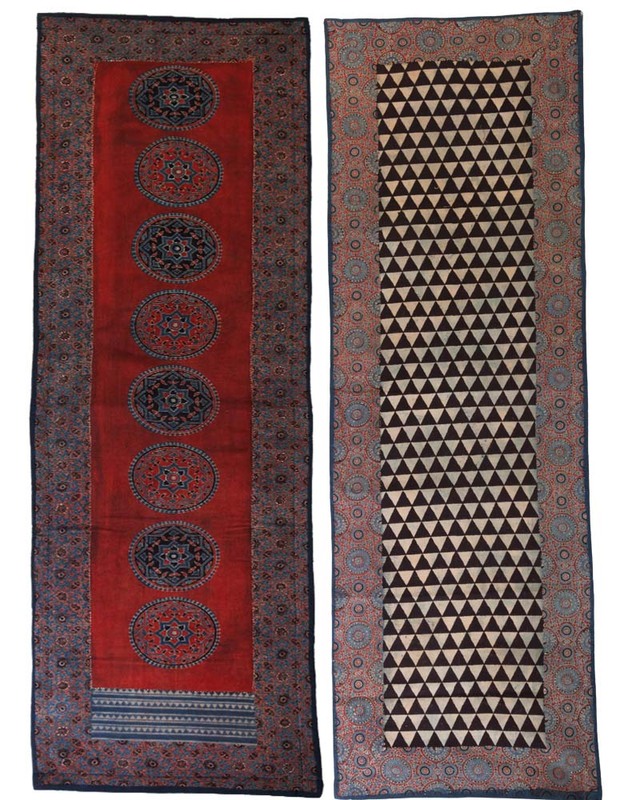 Neel Darpan (1860) is a literary text, symbolic of yet another anti-colonial, nonviolence movement that took place in 1917-18 as ‘champaran’ movement for indigo farmers in India. 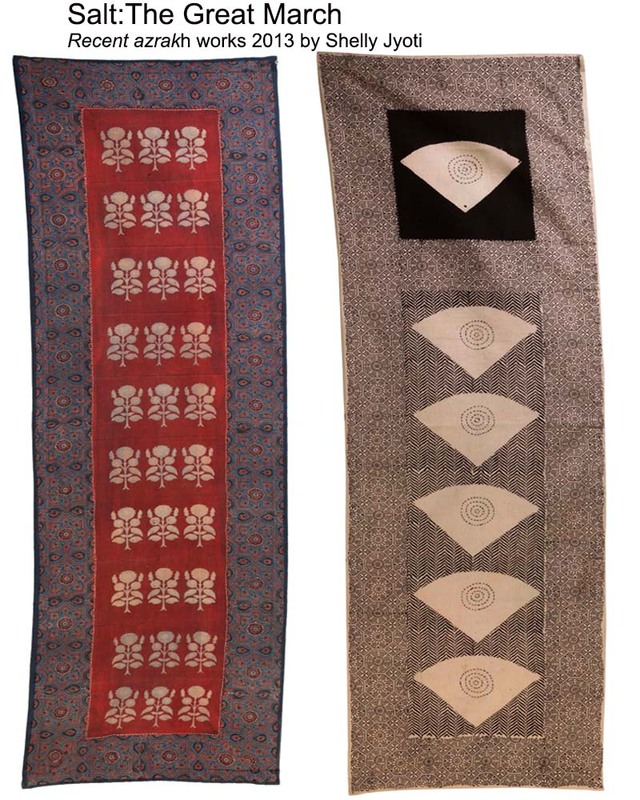 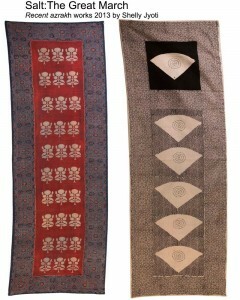 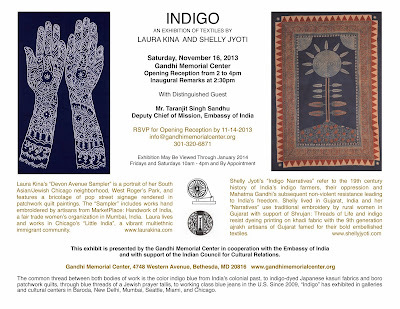 Shelly Jyoti’s new works feature a large khadi fabric with Sanskrit calligraphic print as a site specific installation, two sculptural installations of khadi yarn (aatis) and pipe cleaners, twenty five contemporary artworks with azrakh dyeing/ printing incorporating needle work on khadi fabric and multimedia spoken poetry. 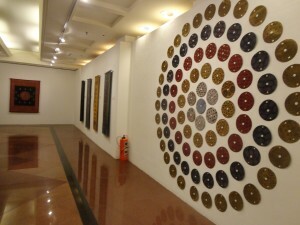 B 43 Trinity Towers, DLF Phase 5, Gurgaon 122002, Haryana. 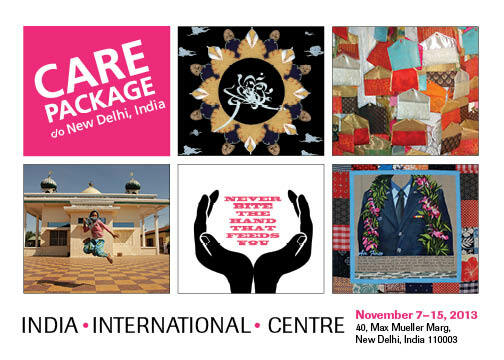 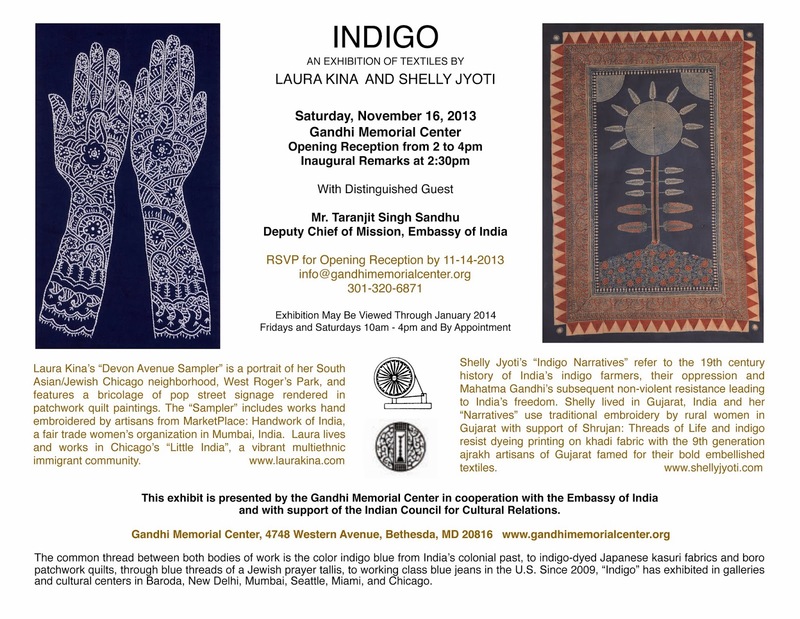 This exhibit is presented by the Gandhi Memorial Center in cooperation with the Embassy of India and with support of the Indian Council for Cultural Relations. 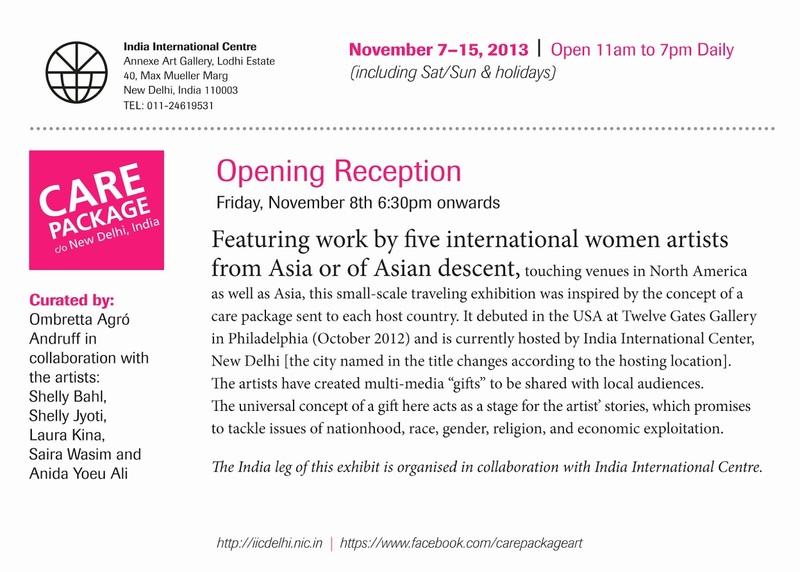 and cultural centers in Baroda, New Delhi, Mumbai, Seattle, Miami, and Chicago. 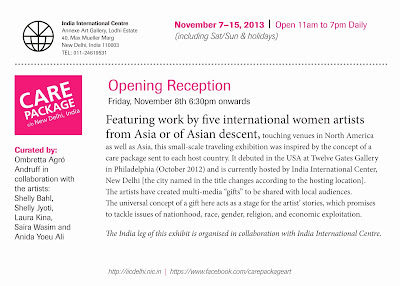 Artists: Shelly Bahl (born in Benares, living between New York and Toronto); Shelly Jyoti (Born in Rohtak, living in New Delhi); Laura Kina (born in Riverside, CA, to an Okinawan father and Basque/Anglo mother, and living in Chicago); Saira Wasim (born in Lahore, living in California); and Cambodian-American Anida Yoeu Ali (born in Battambang, Cambodia, raised in Chicago, currently living in Phnom Penh, Cambodia). 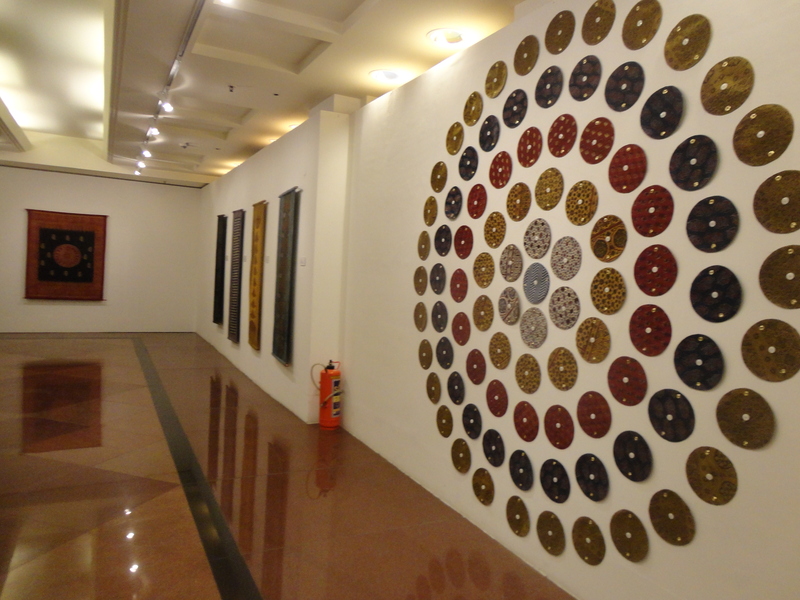 Shelly Jyoti B 43 Trinity Towers, DLF Phase 5, Gurgaon 122002, Haryana.